Since its commercial introduction more than a decade ago, next-generation sequencing (NGS) has matured into an essential life science tool for genetic studies in a range of applications. BCC Research reports that the NGS industry is on the cusp of a second growth phase powered by new applications in clinical diagnostics. The worldwide market for sequencing products was $5.9 billion in 2015 and is forecast to grow at a five-year compound annual growth rate (CAGR) of 18.7% to reach nearly $13.8 billion by 2020. The market can be segmented into pre- and post-sequencing products (i.e., sample preparation reagents/kits and informatics); sequencing instruments and consumables (i.e., flow cells and consumables used in the sequencing reaction itself); and sequencing services. 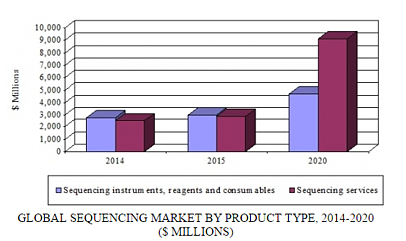 The largest market segment, sequencing services, is also the fastest growing, with an anticipated five-year CAGR of 26%. The main clinical applications driving market growth are cancer and reproductive health. In cancer, there is an increasing need for genomic profiling tests that can be used as the basis for treatment decisions. This is part of a general trend for characterizing cancer on a genomics, rather than an anatomic, basis. Also, the maturation of large-scale government research initiatives such as the Cancer Genome Atlas should spur growth in this market. These projects help to uncover the underlying genomic basis for cancer, creating a need for sequencing-based diagnostics to help evaluate, treat, and monitor patients with cancer. Noninvasive prenatal diagnostics (NIPT) for women with high-risk pregnancy should drive growth of NGS in the reproductive health application. In vitro fertilization (IVF), carrier screening, newborn screening, and NIPT for women with average-risk pregnancy are also anticipated to be key drivers. For example, CombiMatrix (which specializes in DNA-based testing services for preimplantation genetic diagnostics and screening, miscarriage analysis, prenatal and pediatric diagnostics) recently announced that it will begin accepting samples for preimplantation genetic screening (PGS) by NGS. PGS is performed on embryos of couples undergoing an IVF procedure and is designed to examine embryos for chromosomal abnormalities prior to implantation. PGS thus reduces the risk for miscarriage and abnormal pregnancies. The NGS technology that is now being adopted by CombiMatrix and made available for all PGS testing can detect both whole chromosome and segmental aneuploidies. There are few studies to date looking at the feasibility and diagnostic success rate of NGS in the NICU. The Canadian researchers conducted a pilot study with 20 newborns to determine the effectiveness of a targeted NGS panel that included all 4,813 genes currently known to be associated with rare diseases. The 20 newborns presented with a wide range of complex medical issues, and half of them had neurologic symptoms such as seizures or hypotonia. NGS provided a molecular diagnosis for 40% (8) of the infants. In two of them, the molecular diagnoses had a direct impact on their medical management. In a new proof-of-principle study, scientists from Johns Hopkins University successfully showed the potential of NGS as a cost-efficient diagnostic tool for brain infection. The study, published in the journal Neurology, suggests that rapid analysis of the huge amounts of genetic and biological information using a computer could be the new face of cost-effective diagnostic tools. "By incorporating modern genetic sequencing techniques into pathology diagnostics, we were able to investigate the potential presence of infection in 10 subjects and found appropriate explanations of clinical problems in eight of 10 patient cases examined in this study," said Carlos Pardo-Villamizar, MD, associate professor of neurology at the Johns Hopkins University School of Medicine, in a statement. For the study, researchers enrolled 10 patients at The Johns Hopkins Hospital with clinical signs of brain infection and rapid onset of neurological symptoms, including weakness in the extremities, partial paralysis numbness, headaches, or seizures. The researchers conducted a biopsy of the brain lesion of each patient. They then sequenced the DNA of the brain tissue they acquired, using commercially available genetic sequencing technologies. Using a database of human and nonhuman DNA sequences containing 2,817 bacterial genomes, 4,383 viral genomes, and 26 single-cell pathogen genomes, the researchers subtracted out the human DNA results and ranked the top three other species found in the sample that were thought to be potential infectious organisms. With this method, the researchers successfully identified the cause of infection for three of the participants. However, the new diagnostic method depends on the available genetic sequences of pathogens. More research is needed to construct a baseline of what organisms may be found in a healthy brain. There is also a need to expand the current database of human and nonhuman DNA sequences. DNA Sequencing: Emerging Technologies and Applications examines major sequencing trends as well as the key companies and industry sectors. The in-depth study provides insights into sequencing’s transition to clinical and applied markets, giving a solid roadmap to participants and new entrants in this dynamic industry. Analyses of the global market, with data from 2014, estimates for 2015, and projections of CAGRs through 2020, are provided.